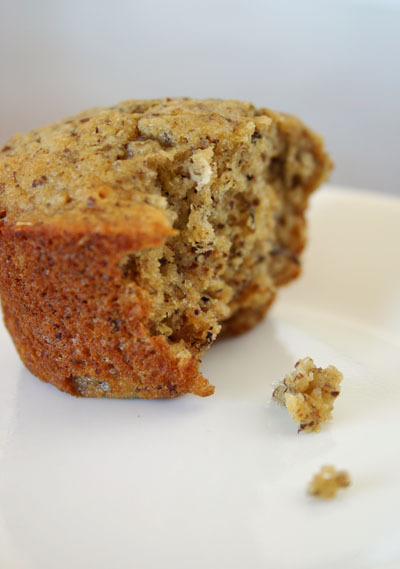 I scoured high and low looking for a healthy bran muffin recipe to incorporate my three overly-ripened bananas into, and I'm so glad I went with this one!! I made them last night, and was tempted to comment then but I decided to wait until I had a second one (cold) today to give my full opinion since everything pretty much tastes good warm out of the oven. Both "versions" were awesome--moist, slightly sweet, and perfectly "nutty" throughout (without any distracting nut chunks).Slight alterations as follows: I ground up my own toasted pecans in the food processor (along with the bran so that I got a finely textured meal), used nonfat yogurt instead of the buttermilk, added a 1/2 tsp vanilla extract, 1/2 tsp banana extract, and a dash of cinnamon and nutmeg. I folded in blueberries to half of the batter, and topped them all off with a little streusel topping (extra ground-up pecan meal, brown sugar, and cinnamon).The best part about these muffins is that they taste just as delicious as the butter-laden varieties, but they pack a lot less guilt. Thanks so much for posting this recipe. I just made these and they're sooooooo delicious! Thanks for the awesome recipe!They taste sinful, but they're really not!The only thing I did differently was add 1 tsp of vanilla because I love it so much.The pecan meal was tricky to grind in my magic bullet, though.I like the idea of using coconut oil given above instead of butter, as I have a lot of that to use up. This is a great recipe. I usually don't put in the pecan meal.Today I made them with pumpkin instead of banana, and added pumpkin pie spices - they came out great!